We initially covered this video of Britain’s Chris Harris testing a Porsche 997 era 911 GT3 RS and a 2014 Chevrolet Camaro Z/28 several weeks ago, but it was only a teaser at the time. Now it’s time for the whole, heaping serving of rev-matching, drifting and overall celebration of the manual transmisson. Calling the 2014 Camaro Z/28 “a big old U.S. truck,” he wanted to see which one would reign supreme in a good old fashioned track dance. Harris drove both cars on a local British racing circuit and as expected in Great Britain, a copious amount of rain was present and accounted for during his extensive period of testing. Despite that though, the Camaro Z/28 earned the kind of respect normally reserved for its Teutonic opponent in several areas from Harris. The Camaro Z/28 is a big track car, however, and Harris did note that the Z/28’s is relative to “a larger track day car for the larger track day gentleman.” Harris also called the Z/28 “an analog car in a digital age” and quipped that “new isn’t always better” when describing some of the Camaro Z/28’s finer attributes. 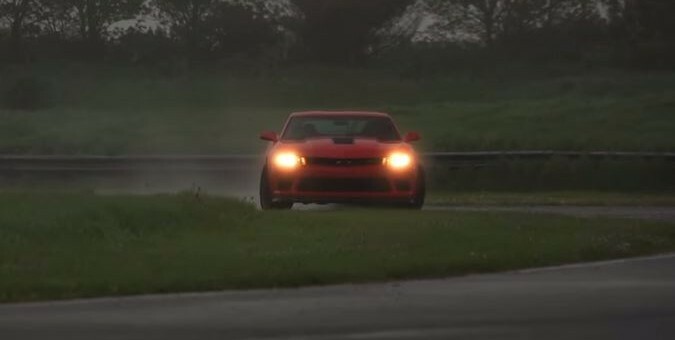 You can see the full video below which features plenty of rain slicked track driving as well as plenty of angles of the Camaro Z/28 drifting in the wet. Wait…there’s people that get paid to have this much fun in a Camaro..? What the hell am I doing with my life?! Guys…I need to do this.